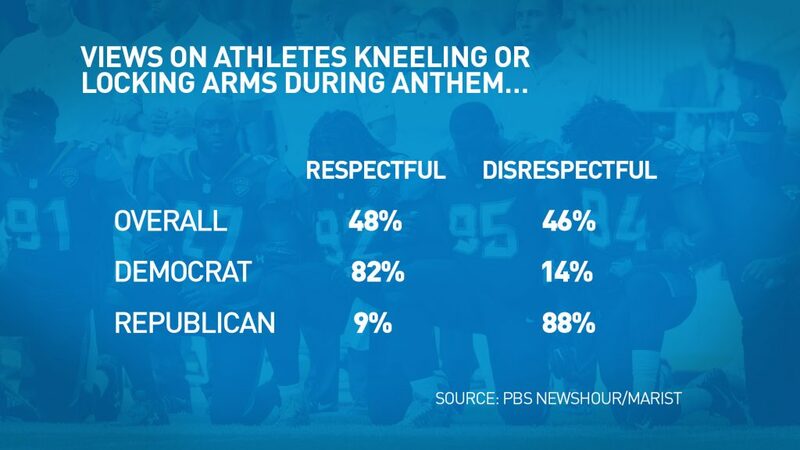 Americans are divided over whether NFL player protests during the National Anthem are a respectful way to attract attention to racial inequality nationwide, according to a new PBS NewsHour/Marist poll released Friday. Nearly half — 48 percent — of U.S. adults said these demonstrations were a respectful way to draw attention to their concerns, while another 46 percent said the protests are disrespectful. The remaining 6 percent of Americans said they were unsure. Along political lines, eight out of 10 Democrats said the protests are civil, while nine out of 10 Republicans disagreed. Like the country, people who identified as politically independent were also sharply divided. Stark divisions also arose among respondents across different racial and ethnic groups. 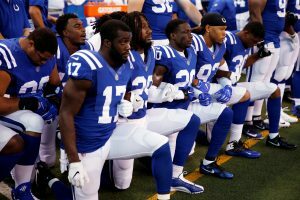 Three-quarters of African Americans said NFL player protests were respectful, while a majority of white Americans — 55 percent — said the demonstrations were disrespectful. The question revealed generational divides, too. Two-thirds of Americans aged 18 to 29 said the protests were civil; only 36 percent of those age 60 or older felt the same. Forty-eight percent of Americans think protests by NFL players during the National Anthem are respectful. But 46 percent disagree. Graphic by PBS NewsHour. But a majority of Americans — 60 percent — agreed with the NFL, saying Trump’s remarks were inappropriate and intended to drive a wedge between people. 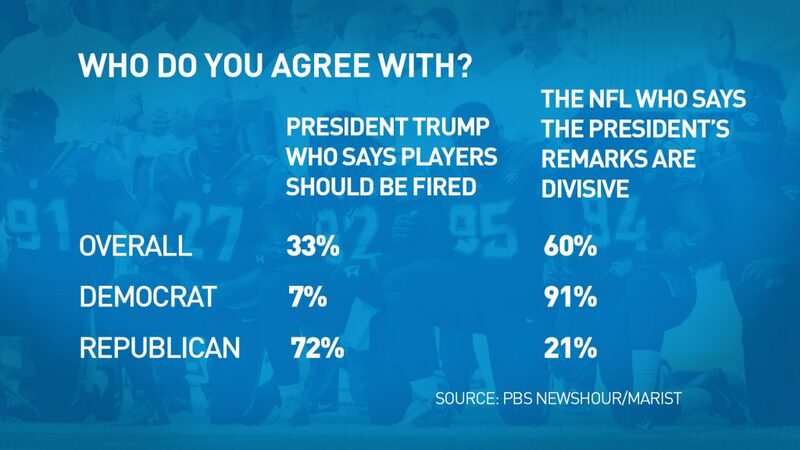 Another third of U.S. adults said Trump was right to criticize these protests as disrespectful and to suggest that the players should be fired. Republicans offered broad support for Trump, with 72 percent saying they stood behind the president’s comments. Only 7 percent of Democrats and 34 percent of politically independent Americans agreed. Nine out of 10 African Americans said the president’s remarks were out of line, while white Americans were more divided over who was right: 40 percent agreed with Trump, while 54 percent agreed with the NFL. The nation clearly is divided over the issue of protests during the National Anthem, but Lee Miringoff, director of Marist Institute for Public Opinion, said when asked about Trump’s actions over this issue, the country supports the NFL by almost two-to-one and says Trump’s comments were inappropriate, offensive and divisive. “If you put Donald Trump into the equation, it tips the scales,” Miringoff said. 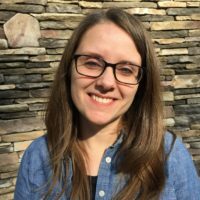 In October 2016, Quinnipiac University polled U.S. adults and found two-thirds of white Americans said they disapproved of protests during the National Anthem, the Associated Press reported. Overall, 54 percent of U.S. adults said they did not support such protests. On Aug. 28, 2016, former San Francisco 49ers quarterback Colin Kaepernick refused to stand during the “The Star-Spangled Banner,” a way to protest racism and how police mistreat minorities, he said. Kaepernick, a free agent this season, drew widespread criticism for his decision, but also inspired other athletes to make similar gestures in the year since. And after the president’s comments, the number of players participating grew. On several teams, players took a knee or linked arms. Some teams decided to skip the anthem altogether in an attempt to avoid the controversy. In some instances, their coaches or owners joined them. Critics say these protests disrespect the sacrifices of the U.S. armed forces rather than call attention to social injustice in this country. After Thursday talks between NFL officials and players, New York Giants defensive end Jonathan Casillas said players and coaches “left Kaepernick to hang” and compared his protest to that of civil rights activist Rosa Parks when she refused to stand and allow a white man to take her seat on a public bus in Montgomery, Alabama. The PBS NewsHour/Marist Poll contacted 1,105 U.S. adults using landline and mobile phones between September 25 and September 27. There is a 2.9 percent margin of error.